For the first time since he was appointed by President Donald Trump, Defense Secretary Jim Mattis was asked by reporters directly: “Are you a Democrat?" It’s not a question that crossed the minds of most reporters during Mattis’ early tenure. The former top Middle East general could be bellicose in the field; Trump had clear affection for that “Mad Dog” image in his rallies. Trump said Mattis was “a true generals’ general.” However, Mattis had never identified himself as a Republican, nor as a Democrat. Mattis is traveling at present to Vietnam and Singapore. It is common for him to talk to reporters on the long flights overseas. The questions are almost always about foreign policy or national security; today, they were also about politics. Q: Mr. Secretary, are you a Democrat? Mattis: Pardon? 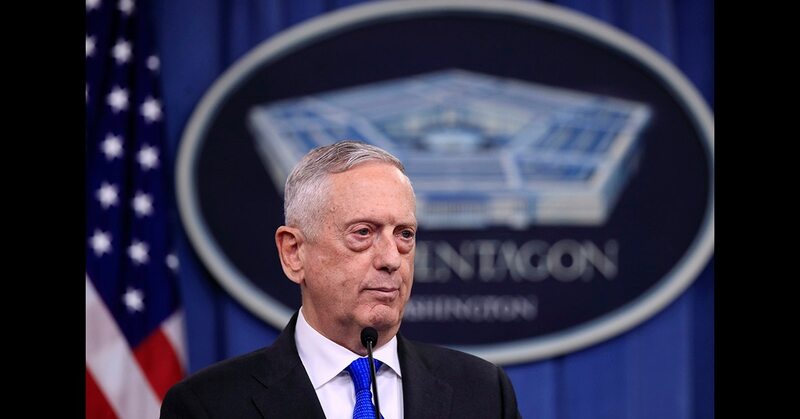 Mattis continued: “But when you think 83 percent of the U.S. Congress voting the same way on an issue put forward by the Republican president, you can see that my portfolio is bipartisan by its very basis, and that is the protection of the United States. That’s what President Trump has told me to do, and I eagerly carry that out, alongside probably the most selfless young men and women — not all young; some old men and women, too — civilian and military, Army, Navy, Air Force, Marines working together. So that’s where I stand. That defines me." Q: I don’t want to put too fine a point on it, but you haven’t registered Republican or Democrat. Is that what I’m hearing you say? Mattis went on to say that he does not have any indications that his job is in jeopardy.